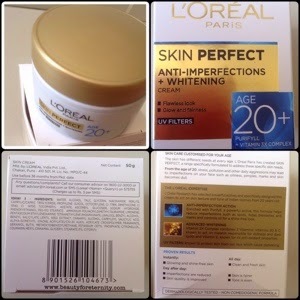 In this short and sweet post I am going to share my thoughts about first impression of Lo'real Paris Skin Perfect Anti-Imperfections+Whitening 20+ cream. I bought this cream from nykaa.com during a massive sale. The moment I opened up the lid, my entire room got filled with a strong scent which faded away after around 30 minutes when I applied it on my face. The cream looks thick but is soft to touch and feels light during application. It feels so hydrating and refreshing to my skin and disappears on my face within seconds. I took a very little amount and it got fully absorbed by my skin. It mattified and brightened up my oily face and I actually liked how soothing it felt on my skin. I also felt a cooling effect during application of this cream on my skin which might be due to the presence of alcohol in it. It looks like a better version of Ponds' white beauty which is sold like a fairness cream. Unlike ponds white beauty, it does not get patchy and leaves no white cast. 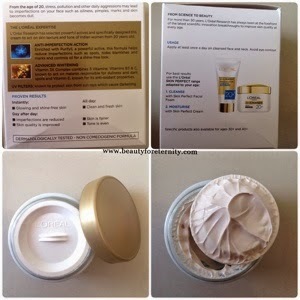 I had high hopes from this cream when I bought it but after using it, I felt a little disappointed. As I said earlier also, it looks like a fairness skin and I doubt it's capability to tackle some serious skin issues that we begin to notice in our twenties. It can be a good daily wear cream for oily and combination skin but I don't think it has got anything to help with the skin problems like spots, blemishes, uneven skintone that one has in her twenties. I need to use it for 2-3 weeks at least before giving my final verdict about it's spot lightening action. Let's see.